According to the Russian Prime Minister, Dmitri Medvedev, Russia’s coal exports in 2016 are forecast to remain level with the previous year and can be described as ‘rather good results considering the current climate’. Actually, the current state of the Russian coal industry is far from being favourable. Is there a future for Russian coal miners and what can the government do to support the industry? Russia ranks sixth in the world when it comes to total coal output. In 2015, coal in Russia was mined by 192 companies: 121 opencast mining operations and 71 underground operations. In 1Q16, 95.7 million t of coal was mined in Russia with thermal coal occupying a substantial share in the total output. 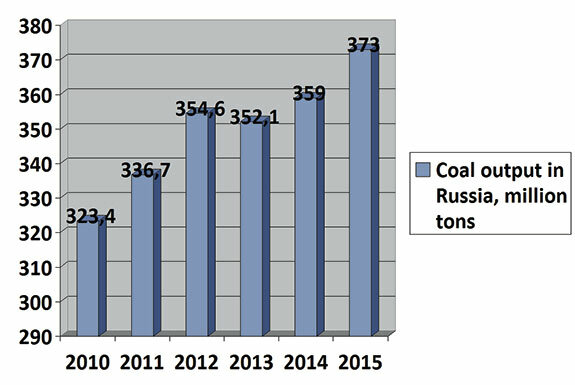 Russian coal output (million t). Russian coal production by type. At first glance, the state of the Russian coal mining industry does not seem to be dismal: in 2015 coal production increased by 4% to reach 373 million t, while consumption growth hit 2%. However, the Russian coal industry is facing a number of problems and risks both in the domestic market and relating to exports. Russian coal miners admit that 2015 was successful in the domestic market due to low water levels in the hydraulic power systems of Siberia and the Far East. This resulted in the load being shifted from hydropower plants to steam plants, including coal-steam plants. But this year is unlikely to bring such good luck. The programme of Siberia gasification is being implemented as planned. With low gas prices, it will develop more quickly. Another stumbling block for coal miners will be an increase in cheap coal imports from Kazakhstan. However, today’s extremely low global prices make the domestic market attractive for selling thermal coal. And the competition in that market will get fiercer. The domestic market is, however, faced with a significant problem in the form of the rates charged by Russian Railways. These rates result in all potential profits often being used to cover logistical expenses. As a result, transportation costs have decreased profit on some coal deliveries to almost nothing. It appears that the domestic sales market of Russian coal is now fully dependent on railway rates. 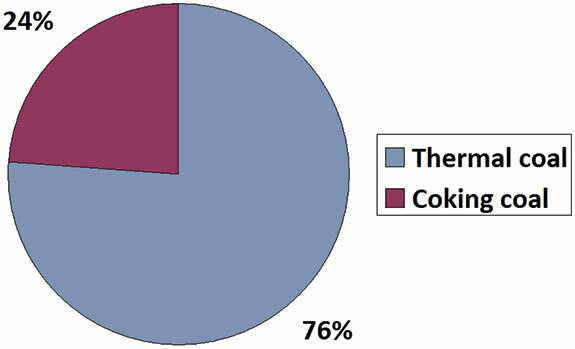 Coal is Russia’s fifth largest basic export product. When it comes to coal exports, Russia ranks third in the world after Indonesia and Australia. In 2015, the export proceeds totalled US$9.5 billion and in 1Q16 they stood at US$1.9 billion. Russian coal mining companies would prefer to export coal rather than deliver it to the domestic market from the standpoint of cost effectiveness. In 2015, the volume of exports was 155 million t, or 40% of the total coal output in Russia. The county’s export volume has constantly increased starting from the post-Soviet era, when global coal prices began to increase. Between 2007 and 2009, the world coal market witnessed a decrease in prices that then gave way to the price increase recorded until 2012. From 2012 to the present day, the global fall in prices have been balanced by a rise in the strength of the dollar against the rouble. The devaluation of the rouble supported exports and offered some advantages to Russian coal in the world market. In addition to low prices, the reduction in coal consumption by many countries for environmental reasons is still the major stumbling block for export. For example, in 2015, Russian coal deliveries to China decreased by 11 million t. In spite of this, China is still one of the primary export markets for Russian coal. In 2015, the main export areas for Russian Coal Group included Poland, South Korea, Japan, China, Bulgaria and the Baltics. The company’s exports can be divided into Europe (51% of export) and Asia and Pacific countries (49%). Deliveries to China are still treated as one of the priority export areas and are carried out via traders, as well as directly through overland borders. Russian Coal Group treats Poland as another top priority foreign sales market, as local production falls due to the high costs of mining. Investment in the Russian coal sector will not exceed RUB 52 billion this year, a fall on previous years, representing one of the major threats to the industry. At the current rate of exchange, it is less than US$1 billion. For comparison, in 2013, investments in the Russian coal industry totalled around US$2 billion. The consequences of this reduced investment will make themselves felt not only in 2016 but also in 2017 – 2018. The investment reserve created in 2013 – 2014 is now used to maintain current production levels. In the opinion of the author, further reduction in investments is impossible because that would pose a threat to the existence of the industry itself. Lack of manufacturing investments will result in an increase in production cost. Coal producers have low profitability and the lack of investment will only make these profitability figures worse. In 2015, Russian Coal Group’s investments totalled around RUB 1.5 billion. In 2016, depending on the market situation, the company plans to invest another RUB 1.5 billion. This level of investment is necessary in order to support its existing facilities, namely seven companies in the Amur region, the Republic of Khakassia and the Krasnoyarsk Territory that employ over 4000 miners. Today, most Russian coal producers suffer losses. Over recent years, the companies’ costs have increased dramatically, while export prices are now at the level of the years 2003 – 2004. If the dollar stands at less than RUB 70, all the positive impact of the 2015 devaluation will be lost. It will be the major stumbling block for business efficiency of domestic coal producers, whose costs continue to increase. After all, considering the devaluation, to upgrade equipment, 60% of which consists of imported equipment, companies will have to pay a much higher price. Russian thermal coal output in 2015 (million t): top five producers. Are not afraid of carrying out restructuring by getting rid of non-performing assets with high operating costs. Continuously optimise costs. Today’s market conditions are forcing coal miners to cut down on everything. Many companies are not adapted to such a state of things. Regularly improve the efficiency of production and management processes. Optimising business processes and increasing labour productivity are now of vital importance. What can the Russian government do? What can the Russian government do in order to support the coal industry? To begin with, it can support the development and deployment of advanced coal processing technologies, which can contribute to making applications of coal more diverse. Developing those technologies is not possible without government support. Taking such technologies to the level of pilot production entails high levels of investment that are currently not available to the business. The payback period is the key to the future. In any event, the future of the Russian economy is closely associated with coal mining: the coal industry now employs 148 000 Russians and another 500 000 Russians are employed in related sectors. Coal companies are crucial enterprises in 31 Russian industrial towns that have the total population of 1.5 million people. About the author: Bilan Uzhakhov is Director General of Russian Coal Group.